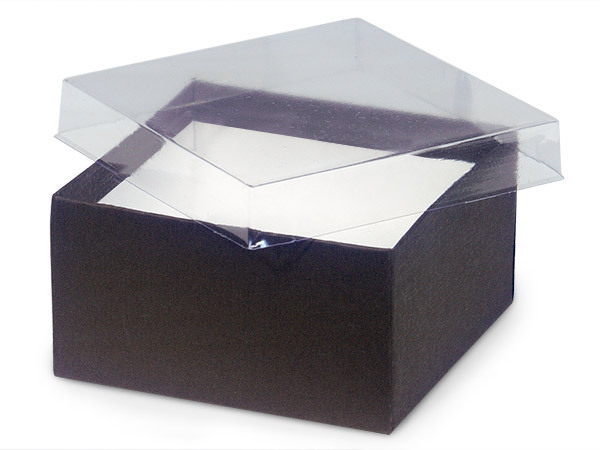 These 3.5x3.5x2" boxes have embossed chocolate bases, clear lids and white interiors. Chocolate boxes contain 100% recycled boxboard which is the largest component of the box by weight, does not include paper outer wrap. These boxes can also be used for candy packaging. These empty boxes do not have synthetic fiber fill included. Made in the USA. Matching Chocolate Candy Pads - Matching Candy Trays - Add a Custom Printed Label!